In this topic you will learn how to add Video Cloud videos to a portal experience. 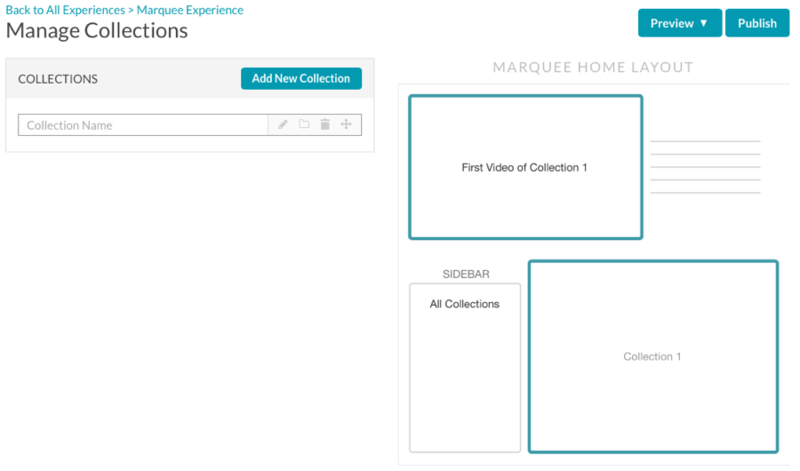 Using the Gallery Collection Editor, you can select the videos to display on a portal experience. With portal experiences, videos are organized into collections. Collections can contain videos from a Video Cloud account or from a YouTube channel. This topic will focus on adding Video Cloud videos to a collection. For information on adding YouTube videos to a collection, see Adding YouTube Videos to a Portal Experience. Click VIDEOS in the left navigation. The Manage Collections page will open. The right side of the page displays a preview of the home page video layout for the selected template type. Enter a name for the collection and press enter. The name will be displayed to viewers so make sure to use a meaningful name. Click the edit ( ) icon to edit the collection name. To edit a collection, click the collection name. The Edit Collection page will open. 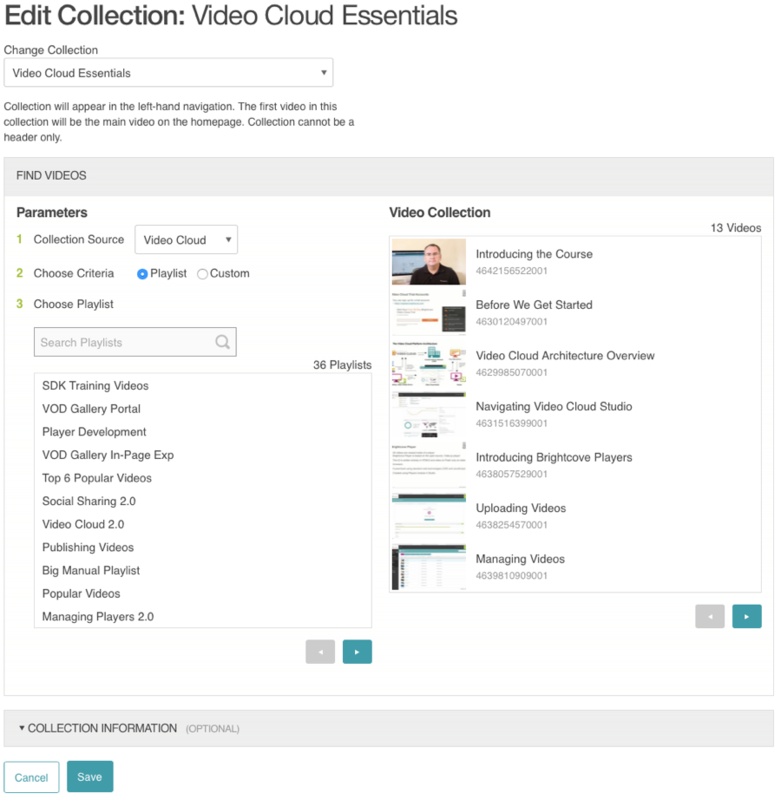 The Edit Collection page is used to add videos to a collection and to configure additional collection properties. The Change Collection dropdown will list all of the collections that have been created. Select the collection to edit. The preview on the right will show where the collection appears on the Home page. YouTube - YouTube video content will be used. For information, see Adding YouTube Videos to a Portal Experience. Note: Values that have been entered for Include Tag and Exclude Tag as part of the SITE FEATURES > Site Search settings will also apply to any collections that are created. This may limit the videos you see displayed when creating collections. Note: If you recently made changes to video metadata or playlists, those changes may take up to 6 minutes to appear inside the Collection Editor and on published experiences. 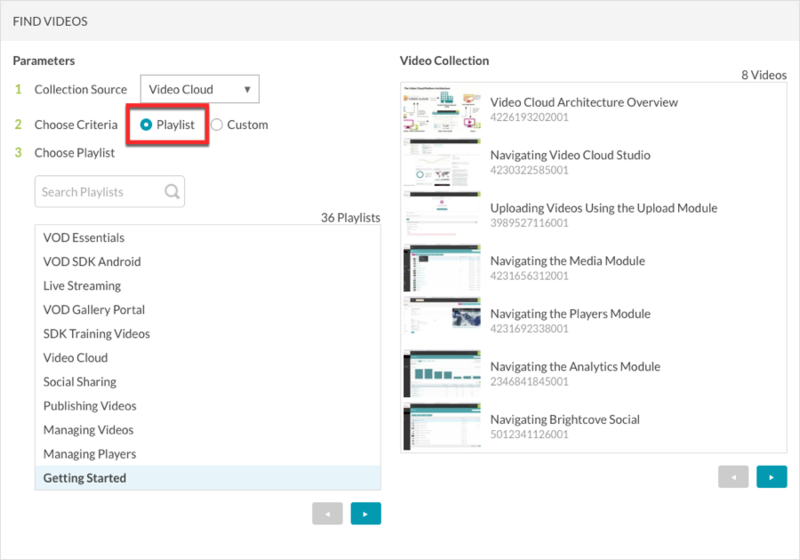 When you choose to use a Playlist video assignment, videos in the collection will be based upon a Video Cloud playlist. Select the Playlist option. A list of playlists in your Video Cloud account will appear. Use the navigation controls ( ) or the search feature to locate to the desired playlist. After selecting a playlist, the list of videos in that playlist will be displayed. Note: The order of the videos in the collection is based upon the playlist settings. (Optional) Depending on the template selected, additional collection details can be configured. For more information, see the Adding collection information section of this topic. 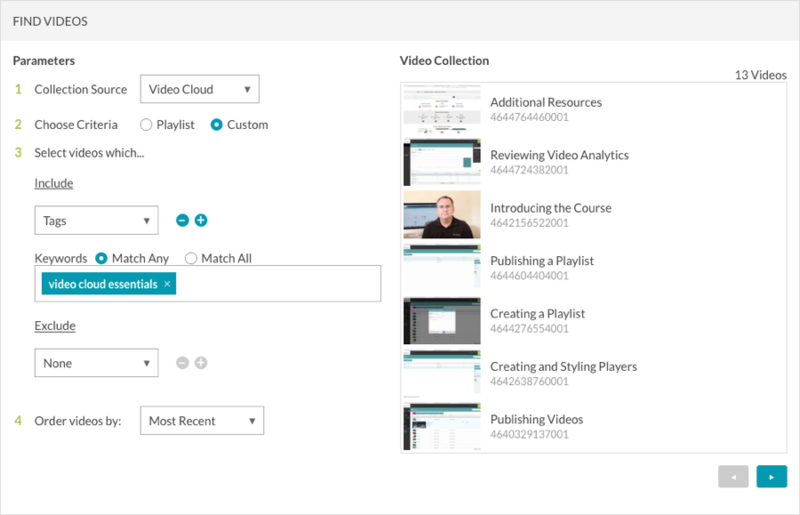 When you choose to use a Custom video assignment, videos in the collection will be based upon video tags, a custom search or custom metadata fields. Search parameters can be set to Include or Exclude videos based upon Tags, Search or a Custom Field. Note: When using the Custom Field option, you should enter the Internal name of the custom field, NOT the Display name. 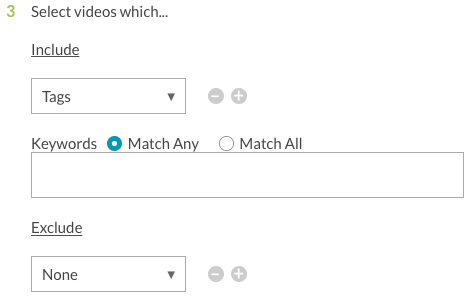 Configure the appropriate search parameters to return the desired videos. In the following example, videos that have been tagged with video cloud essentials will be returned. (Optional) Click the add icon ( ) in the appropriate section to include or exclude additional parameters. Depending on the template selected, collection details can be configured. To add collection details, click the COLLECTION INFORMATION section. 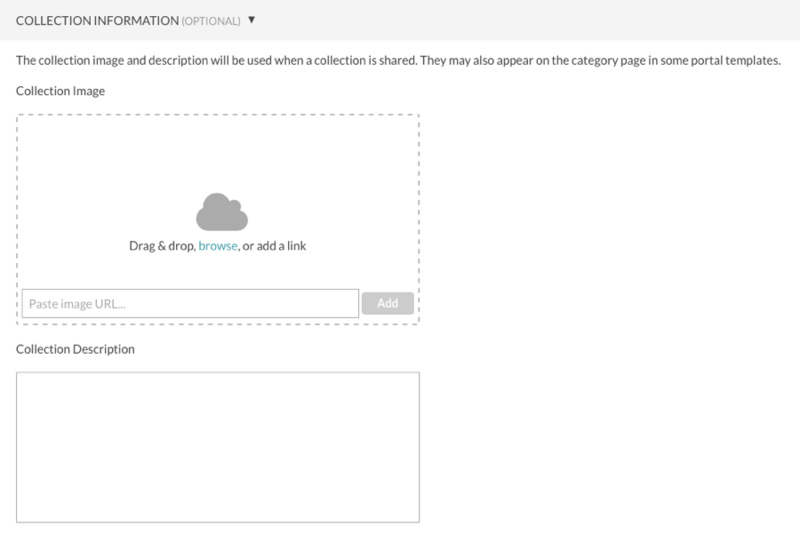 The collection information section provides the ability to add a Collection Image and Collection Description. Some social networks will use the image and description when a link to the experience is posted to social media sites. The Collection Image is used to represent the collection on a Gallery site. If no collection image is specified, Gallery will assign one using the video thumbnail from the first video in the collection. To add a collection image, click browse and select an image from the file system. You can also drag and drop an image to the designated area. The Collection Description is used to describe the collection.